With over 72,000 attendees from over 86 countries annually, South by Southwest (SXSW) is considered to be where the world’s most prominent influencers in tech, art, music, fashion, and film go to present, learn, entertain, and network. SXSW started as a tech convening, but has since expanded to a diverse conference that spans 25 tracks of programming ranging from music, film, gaming, style, politics, food, healthcare, and global and social impact. 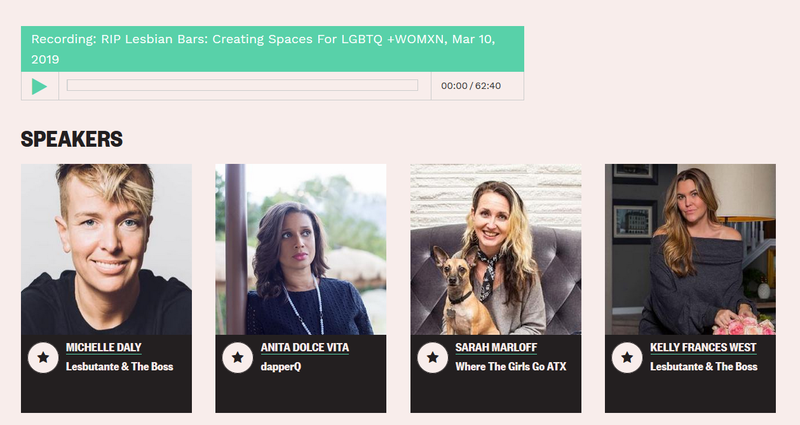 SXSW has also ensured that LGBTQIA+ representation is included within each of these tracks and, in 2018, they developed two full days of programming dedicated specifically to LGBTQIA+ topics. From March 10-11, the LGBTQIA+ Series of Sessions examined topics such as community alliances, the gender spectrum, activism, visibility, the movement towards equality, and more. SXSW receives over 4,600 proposals annually. In 2016, dapperQ was the first queer style panel featured at Sxstyle, and our proposals have been accepted for three consecutive years thereafter. This year, our goal was to expand our discussion of style beyond clothing to include the beauty industry. Our panel “Blurred Lines: Beauty in a Gender Fluid World” examined how the beauty and cosmetics industry has long focused on marketing to a narrow demographic of homogeneous women. However, social media and greater acceptance of non-binary gender identities and gender presentations are challenging the beauty industry to be more diverse and inclusive. 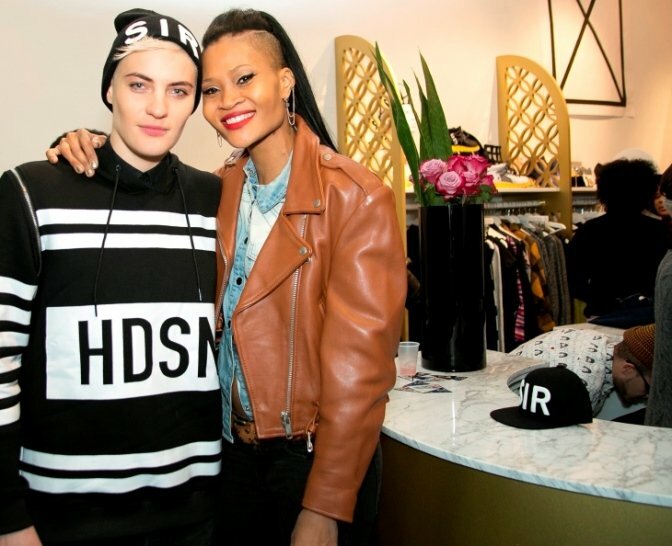 Younger generations are abandoning conventional notions of gender, and social media platforms are spurring the democratization of beauty that allows for transcending gender-based beauty boundaries and for consumers across the gender spectrum to emerge as the creative directors of their own beauty without corporate brands dictating how they should look. Our panel of queer beauty experts included Ann Bradstreet Brown, the Director for Global Brand Supply Chain (GBSC) at Bumble and bumble; Christopher Sayasith, the Director, International Business Development, Strategic Initiatives for Estée Lauder Companies, a well-diversified powerhouse of 30+ brands (MAC, Tom Ford Beauty, La Mer, Le Labo, Lab Series, GLAMGLOW, etc. ), and the global leader in prestige beauty; and Dev Seldon, Qwear Brand Ambassador and non-binary artists, dancer, model, and beauty influencer whose work is centered around gender and diversity. The panel was moderated by Anita Dolce Vita publisher and Creative Director of dapperQ. Audio from the full panel can be access by clicking here and hitting play at the top of the page. Social media has allowed Millennial and Gen Z consumers to be creative directors of their own personal brands (selves). They are no longer waiting for mainstream media and brands to recognize them and are instead creating their own paths and platforms, thereby democratizing beauty. The inclusivity movements are pushing mainstream brands to respond to consumer demands and spending behaviors. M.A.C. was the first beauty brand under the Estée Lauder Companies umbrella to embrace and advance makeup for everyone across the gender spectrum, while also donating revenues to communities impacted to HIV/AIDS. While some feminist movements once viewed beauty products as a means of the patriarchy to control women, today people of all genders are using beauty products as a tool for self-affirmation and liberation. Ann reminded the audience that makeup has a history of being used as a vehicle for resistance, from the punk to drag communities. Christopher points out that many “men’s” and “women’s” beauty products may contain the exact same formulations, but some established brands feel the pressures of toxic masculinity to use binary “men/women” packaging and branding in order to appeal to male consumers. 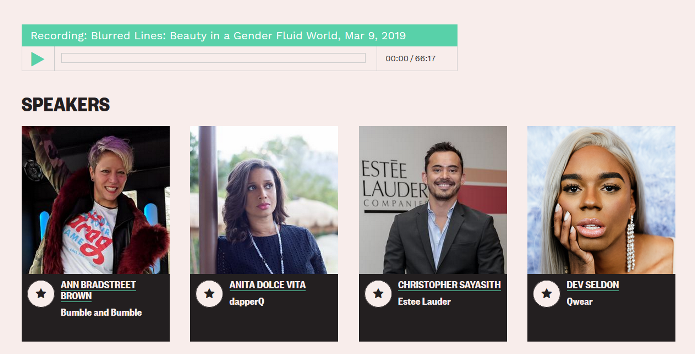 Dev mentions how newer, independent beauty brands like Fluide are launching from day one as gender-free and believes that this is the best practice for brands to show true commitment to dismantling binaries within the beauty industries. Chris, however, feels that, because toxic masculinity is so entrenched in society and limits people’s self expression, there is some benefit to offering lines of beauty products marketed specifically to men in order to take smaller strides towards opening the door to those who may be initially hesitant to use beauty products. Anita and Ann briefly discuss the beauty binary that exists within the queer women’s community (butch/femme) and how that is slowly changing with younger generations re-defining what is traditionally feminine and masculine, and accepting wider ranges of gender presentations. Anita Dolce Vita was also invited to speak on another important topic: “RIP Lesbian Bars: Creating Spaces For LGBTQ + WOMXN.” The moderator’s hypothesis was: As the LGBTQ community gains more acceptance in the world, we’ve seen a smaller amount of spaces dedicated to the community, specifically ones for womxn. Although equality is what we continue to fight for, we don’t want to be homogenized into the greater public. This would make us less visible and less accessible to those seeking out their community. With the closing of lesbian bars, we need to pioneer the new movement that creates community without solely depending on a bar. This panel will discuss why it’s important to continue to create these spaces without having a brick and mortar location, and why the “temporary” separation is necessary. Last, we will discuss why cities with womxn focused events have a significantly higher attendance as a whole during Pride celebrations. Panelists included Anita Dolce Vita, publisher and Creative Director of dapperQ; Sarah Marloff, a News Staff Writer at the Austin Chronicle for the Gay Place and Civics Listing Editor; and Kelly Frances West, Lifestyle Designer and Co-Owner of the premier lesbian event production company in Austin,TX, Lesbutante and the Boss. The moderator of the panel was Michelle Solorzano Daly, Purple Heart Army Veteran and Co-Owner of Lesbutante and the Boss. Anita’s findings revealed that Millennial consumers, regardless of sexual orientation, are not drinking as much and not frequenting nightclubs as often. They are looking for more interactive, tailored, unique experiences. More than 10,000 nightclubs have closed across the U.S. in the last decade. However, lesbian bars have been closing at a higher rate because of greater acceptance (in some regions) of queer women; the rise of dating apps; gentrification; a history of lesbian bars not being inclusive of transgender, non-binary, femme, POC, disabled, and sober consumers; and a demand for more diverse experiences that do not center around bars and nightclubs. Queer women are not a monolith. Their interests are just as rich and diverse as any other group and range from travel, family, food, fashion, art, and much more. Queer event planners are recognizing this and producing fashion shows, culinary events (Babetown in NYC), and athletic meetups. Kelly’s research found that cities with Pride celebration programming that includes queer women’s events have larger Pride attendance. Queer women’s spaces still serve an important role because they allow for queer women to be themselves and express themselves in a safe environment. That said, bars/nightclubs/parties should not assume that all queer women have the same interests. Sarah acknowledged that privilege and oppression operate within queer women’s spaces and that producers need to address this. It is recommended that queer women’s bars/nightclubs/parties should diversify their programming to survive, and focus on diversity and inclusion. *Note: dapperQ as a whole does not necessarily endorse any of the individual opinions of the speakers. The Future is Fluid: How Gender and Sexuality Has Changed ft: Alok Vaid-Menon, gender non-conforming performance artist, writer, and educator; Phillip Picardi, Editor-in-Chief of OUT Magazine; Robyn, CEO & Founder of HER the world’s largest brand for LGBTQ womxn & queer people; and Leyna Bloom, biracial transgender model, actor, dancer, and activist. Black Twitter in Hollywood, Politics and Brands ft: Kimberly C. Ellis, Ph.D., an award-winning Scholar, Artist, Activist and Tech Entrepreneur; and Nse Ufot, Executive Director of the New Georgia Project. Previous articledapperQ Celebrates 10 Year Anniversary with Programming Across the U.S.